. Perfect to match the larger 11" size circular salad bowl. 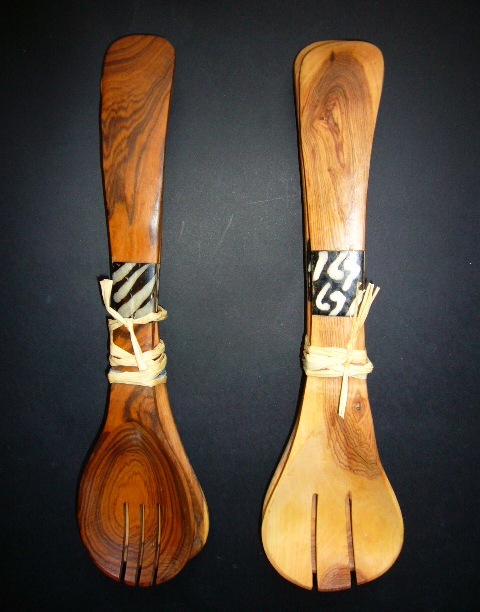 These items are handmade in the village of Makindu on the slopes of the Chullu Mountains in Eastern Kenya; the wood craftsmen and women here have formed a cooperative to ensure they share and receive a fair wage. The salad servers can be handwashed or wiped clean with normal washing-up detergent and water. It is advisable to occasionally rub some olive oil into the wood to keep them in prime condition. Weight of this item : 0.65 kg. Overseas customers - please note that multiple purchases of heavy items may override the Royal Mail limit of 2 kg per parcel and therefore necessitate more than one parcel. If this is the case, we may have to contact you after purchase to adjust postage charges.